Walton Arts Center was excited to host the 2013 Arts with Education Institute (AWE) last week! The annual week-long professional development is designed to train Northwest Arkansas teachers to integrate the arts into everyday lesson plans, connecting to core curriculum. WAC hopes to positively impact the classroom learning experience for both teachers and the almost 1,200 students that are influenced by the AWE teachers each year. “Arts integrating will help my students build their cooperation muscles,” said an AWE teacher about the foreseen benefits of the program. Arkansas History, Social Studies and Visual Arts were the focus areas for AWE 2013. Teachers learned how to integrate the arts in these subject areas with hands-on, interactive workshops presented by John F. Kennedy Center professionals. “My students will be better in communicating,” said an AWE teacher about the program. This year’s AWE featured lectures and workshops led by Sean Layne from The Kennedy Center. Layne has a B.F.A. in Acting, and has been a part of numerous arts education programs such as founding Focus 5 Inc., arts coaching for the Kennedy Center’s Changing Education Through the Arts (CETA) program, directing and set designing for the InterAct Story Theatre and internationally representing the Wolf Trap Institute Early Learning Through the Arts program. Some of the workshops led by Layne at AWE this year were Intro to Arts Integration, Acting Right, One Minute Challenges, Strategies for Memorization Text Cards and Connections to Common Core. Trike Theatre teaching artists assisted directly in the teaching of AWE, and will help teachers throughout the year by periodically stepping into the classrooms. Along with working at the Walton Arts Center, the AWE teachers travelled to Crystal Bridges Museum of American Art for additional hands-on instruction. Lectures and workshops at CBMAA included an Introduction to Teaching from Art lecture and a Teaching Content with Artwork workshop given by teaching artists. While at Crystal Bridges, School Programs Manager Anne Kraybill began a lesson plan revolving around visual essays with an introduction to Visual Essay Instruction. This was followed by Creating Visual Essays given by a team of leaders. After the teachers were introduced to the concept and structure of visual essays, they were taught how to implement the learning technique in the classroom with the facilitated reflection Bringing Visual Essay Back to the Classroom. “My students will be highly engaged and own their learning,” said one AWE teacher about the lesson plans. We are excited to see these teachers take what they learned about arts-integration back to their classrooms this fall! 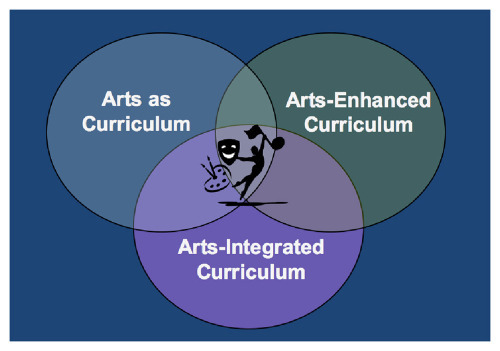 To learn more about Arts with Education Institute visit our website! Funding for AWE is provided in part by Crayola® with additional funding from Arkansas Arts Council and Walton Arts Center supporters and benefactors.